One of the problems we’ve been having from the start is that the motors I used were recycled from a couple of electric scooters and not only they are kind of weak, they are also unequal: one is 200W nominal and the other 240W. This wasn’t too apparent until recently when we implemented regenerative braking, which uses the power generated by the motors to stop the Trike and charge the battery; when I tried short-circuiting the motors to stop the Trike, it was very clear how weak the motors actually are, and how different from each other – the Trike turns right while braking because the right-hand motor is stronger. And here they are, fresh off ebay, from the UK. A couple of freshly picked 350 Watt motors. The key question is: will the battery pack allow such high peak currents (60A)?… I’ve already upgraded the original pack that I built for the Faire with a 3rd pair of batteries, to not just expand the total range but fundamentally avoid the voltage drop that occurs due to internal resistance when we pull too much current from them. An added bonus is that the effective range also grows due to a smaller Peukert effect. 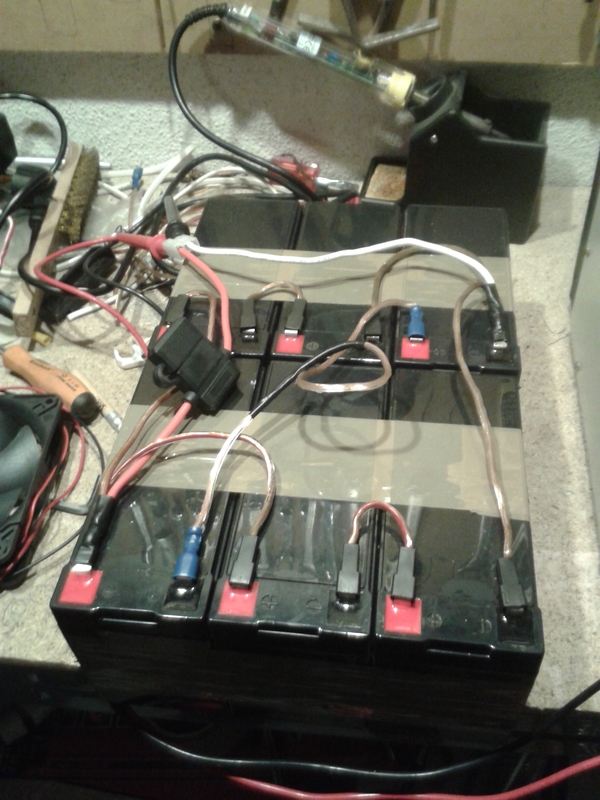 Current battery pack: 3 parallels of 2 batteries in series, for a total capacity of 24V x 21Ah = 504Wh.